Update October 11, 2013: The outgoing links have all been updated. This post is by far the most popular. So I should try to keep this post up-to-date. However, I haven’t been to Kansai since the Fall of 2009. Happy transit travels to all you Kansai travellers. When one thinks about public transit in Japan, one often will think first about trains. There are just so many trains in Japan. The trains are famous for their punctuality and their crowds. Initially, looking at the map of the Kansai rail network, it looks an electrician had purposely crossed all the wiring. Where could I start with such a mess? Well, first I looked for where the airport was and where the hotel was tried to figure how to get from point A to point B. Originally, I thought we would be flying into Kansai International Airport (KIX), so I read about different trains that ran from KIX to Osaka. There were a couple of ways. The most direct and the fastest would have been the Nankai Airport Express, also known as Rapito-β. That would have taken me into a part of town called Namba, which was one subway stop away from our hotel. That seemed easy enough. However, when we actually got our tickets, I realized we would be flying into the smaller Osaka International Airport in Itami. That meant we would actually end up taking the Osaka Monorail (and yes, you would be right if you guessed there was an Expo in Osaka at one time). 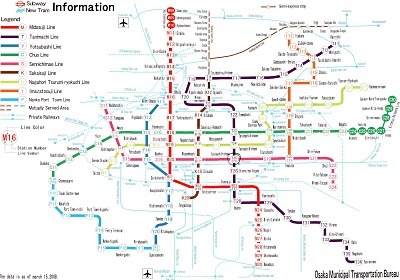 We would take the monorail for a few stops then transfer to the red line (Midosuji) of Osaka Municipal Subway system. So that was the start of figuring out the colours. The most consistent colours belonged to the different lines of the Osaka Municipal Subway. The Subway is made of 8 lines plus the New Tram. The main line that we used was the red Midosuji Line. It goes north-south through the major areas like Umeda, Shinsaibashi, Namba, and Tennoji. We did use the Chuo line, a major east-west line, to get to Osaka Castle and to the Osaka Port area of Tempozan. These lines will likely carry you throughout most of the city to most of the major destinations. There is a transit pass in Osaka known as the Osaka Unlimited Pass. The 1-day version allows unlimited travel on the Subway and some of the private lines. The 2-day version of the Osaka Unlimited Pass is not so “unlimited”. It’s restricted to unlimited travel on only the Subway lines. If you buy the pass, it comes with a handy guide on how to get to different tourist attractions via the Subway only. If you have a travel book, it may only suggest the nearest train station or the fastest train route without thinking about how you paid to get there. So if you bought an Osaka Unlimited Pass, you will not be suddenly hopping on one of the private lines or the JR Line to travel that day. You would want to travel strictly on the Subway system for that day. Plus, you can get discounts at some of the attractions along the way. I know we got our money’s worth out of our Osaka Unlimited Pass. The Osaka subway signs are very reminiscent of the Tokyo subway signs. Perhaps all the subways in Japan have similar signage. Each station has the name in Japanese (Kanji, Hiragana, and Romanji) and is also identified by a Letter-Number-Colour combo. 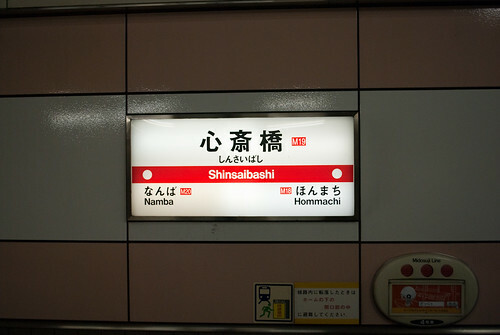 For example, Shinsaibashi Station on the Midosuji Line is station M19 (printed in red). There is also a Shinsaibashi Station on the Nagahori Tsurumi-Youkuchi line which is identified as station N15 in olive green. 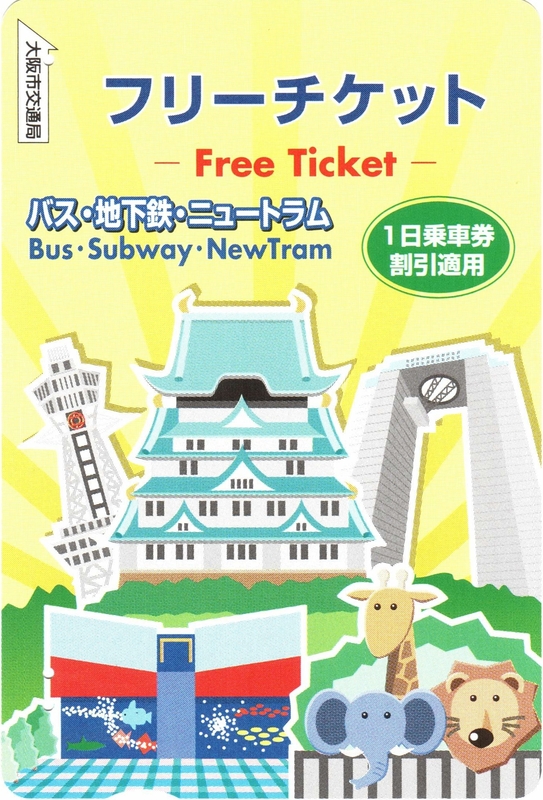 At the end of the day, I would say that if you are in Osaka only and you buy the Osaka Unlimited Pass, then the Subway will serve your needs very well. However, if you plan to go a little further afield, then you may have to consider one of the other train lines. Japan Rail (JR) is probably Japan’s largest rail company. There are JR lines everywhere in the country. If you have to go from city to city, then JR is likely the way to go. They definitely had some of the better seats compared to the subway and private lines. It’s probably because you tend to go farther if you are riding a JR train. You can also purchase JR passes in Japan or even before you leave. Most travel agencies that specialize in Japan will carry this rail pass. The pass will even let you ride the Shinkansen, or bullet train (but not the top end Shinkansen). JR also does operate some inner city trains in Osaka. The most obvious example would be the JR Osaka Loop Line that circles the Osaka’s central core. It would be similar to Tokyo’s Yamanote Line. We also used JR to get to Kyoto. It was the quickest and most comfortable way to go from central Osaka (Umeda in this case) to Kyoto Station. So the day that we took JR, we did not use any of the other train passes. It was a quick half-hour ride from Umeda in Osaka to Kyoto Station and with forward facing seats. We also had taken the JR train to the Sagano-Arashiyama area of Kyoto because, again, it was the quickest way and dropped us off right where we wanted to be. In our case, we were going to take a scenic rail ride known as the Sagano Scenic Railway. It is also known as the Torokko Train in Japanese. Uji, another town just southeast of Kyoto, is also best accessed by JR. The JR Uji Line is very direct with little stops. It stops right in the middle of Uji and is steps away from the 956 year old Byodo-in Temple.